Personalize everything from the template to the wording. 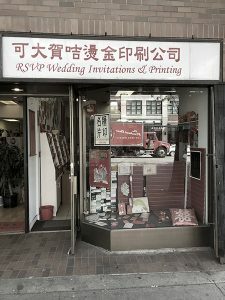 Established in Vancouver Chinatown for over 20 years, RSVP Wedding Invitations & Printing has served many companies and individuals with a variety of custom printing needs in Vancouver, Richmond, Burnaby, Surrey and the Greater Vancouver area. We specialize in gold foil stamping and embossing, and take pride in both quality and professionalism. We have recently moved to a larger facility. Email or call us at your convenience as we would be happy to answer your questions or provide you with a free quote. Book an appointment to visit us at our showroom or production facility.